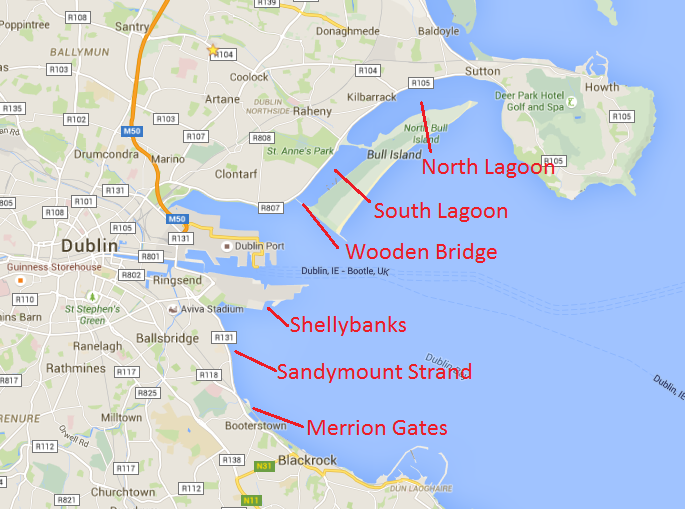 Dublin Bay Birds Project: Colourful jigsaw pieces added to the puzzle! Colourful jigsaw pieces added to the puzzle! A day spent reading colour-rings, with your help, has allowed us to gather important information on 51 individuals across five different species. 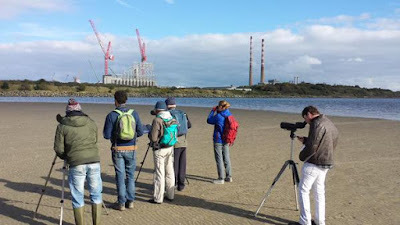 After a brief introduction to the project at the Bull Island Interpretative Centre, volunteers and equipment were divided, and two teams headed out into Dublin Bay in search of birds with bling (colour-rings). As the tide rose, it pushed the feeding birds closer to the shore, where teams stood ready, searching legs for splashes of colour. We managed to read colour-rings on five species; 32 Oystercatchers, 9 Brent Geese, 5 Bar-tailed Godwits, 4 Redshanks and one Black-tailed Godwit. When a colour-ring sighting is submitted, a detailed history, showing information on all re-sightings of that ring, is returned to the person who submitted it. Ringing and re-sighting information for colour-ringed Oystercatcher "LL"
One Oystercatcher, LL, which was spotted on the day, has been re-sighted 11 times since it was ringed in February 2013. The first sightings were during the autumn/winter of 2013/14 when LL turned up at Bull Island, Merrion Gates and Shellybanks, exploiting foraging opportunities on both sides of the bay. However in May 2014, LL was reported in Orkney in Scotland. A few months later LL returned to sunny south Dublin, with sightings from August to December at Sandymount. After that, LL disappeared off the radar until August 2015, when it was spotted back at Merrion Gates, before being spotted again in October at the same place. The majority of colour-rings read were part of the Dublin Bay Birds Project, but we did manage to spot some non-project birds, ringed by other schemes. 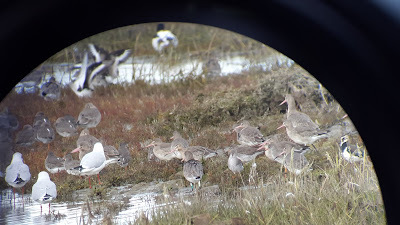 A lot of patience was required to read a Black-tailed Godwit ring (LG-WL - lime over green on left leg, white over lime on right leg). After a quick tweet to @JenGill3, Professor of Applied Ecology at the University of East Anglia, who works on Black-tailed Godwits, we discovered that LG-WL was ringed in the south-western part of Iceland in April 2000, and has been re-sighted 52 times since then! Between 2001 and 2014 LG-WL was re-sighted a whopping 47 times in Ireland, with 46 of those sightings in Dublin Bay and one in Cork harbour, in 2003. Towards the end of 2014 LG-WL was spotted at the Wash Estuary in Lincolnshire in east England, but returned to Dublin Bay in September 2015. Throughout the day, nine Brent Geese with colour rings were also spotted, and their details hae been sent to the Irish Brent Goose Research Group. 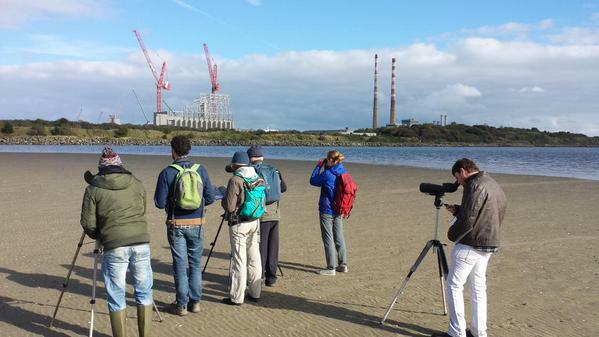 If you spot a colour-ringed bird in Dublin Bay or elsewhere, we are very keen to hear from you. More information on how to report a colour-ring sighting can be found here. Follow the project on Twitter using #DubBayBirds.